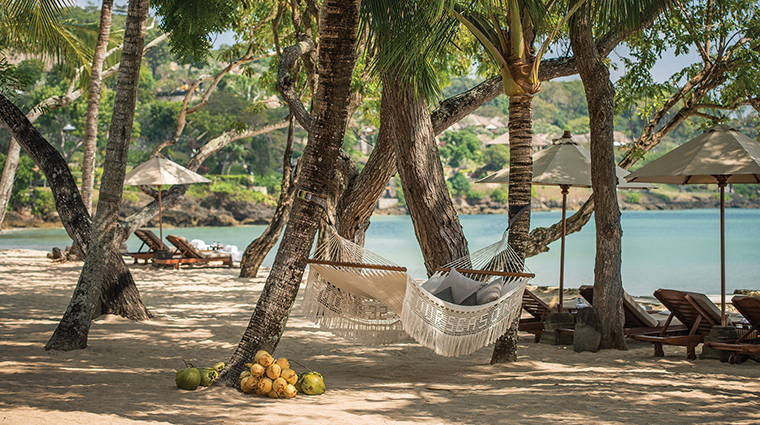 There’s a magic formula at work at Four Seasons Resort Bali at Jimbaran Bay, one that’s made the hotel as romantic for couples as it is fun for families. The resort is just across the bay from the airport, so you won’t sacrifice beach time stuck in gridlock. 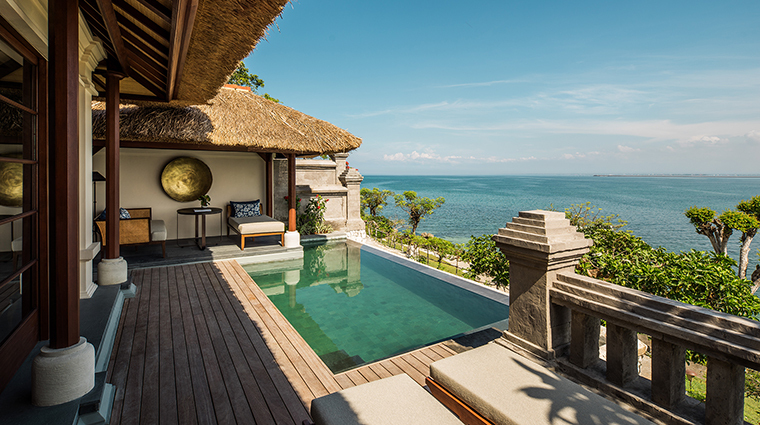 Each villa has a private pool, so you can swim in seclusion or take a dip in the infinity pool overlooking Jimbaran Bay. Add in beachside dining, complimentary water sports and a roster of activities, and you may never want to leave resort grounds. Hop an electric buggy down to Coconut Grove, the resort's private two-mile beach, where the Bali hotel offers three complimentary water sports — kayaking, windsurfing, and Hobie catamaran sailing (go out on your own or with one of the beach staff). 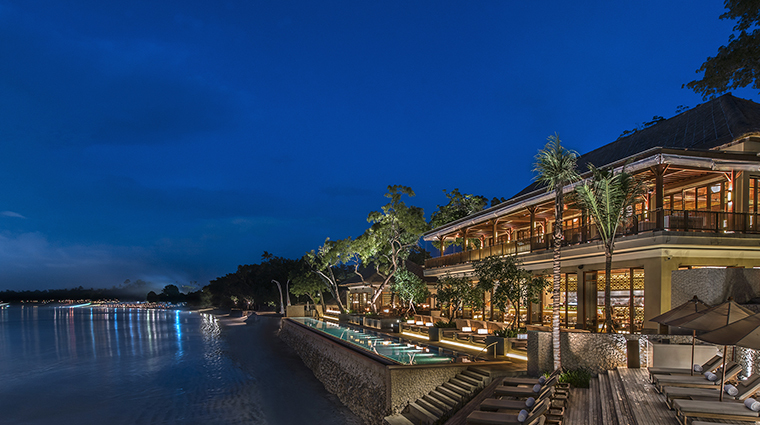 Sundara is the place to listen to live music, sip cocktails and watch the sun set over Jimbaran Bay. Bonus: you can come here right from the beach. The resort has a roster of activities from sun-up until sundown. Yoga, adult tennis match-ups, Balinese dance performances and tours of the resort’s Hindu shrines are all included in the room rate. Drop the kids (ages four and up) at Jimba Club, where they’ll spend the day flying kites, building sand castles, bowling with coconuts and going on treasure hunts. The luxury hotel also offers a children’s pastry class and tennis clinics for all skill levels. Four Seasons Resort Bali at Jimbaran Bay also offers a stand-alone cooking school where you can take classes to discover secret local techniques using organic Indonesian ingredients from the resort’s own culinary team. For an ultra-romantic meal, enjoy dinner à deux on your villa’s terrace. Couples (and all guests) can book a variety of local experiences including cocktail classes, spa treatments utilizing products made of local ingredients, and a market tour with a cooking class. Surfers of all levels can enjoy the resort’s beaches that offer some of Bali’s best breaks and surfing lessons for beginners in the calmer waters of the bay. 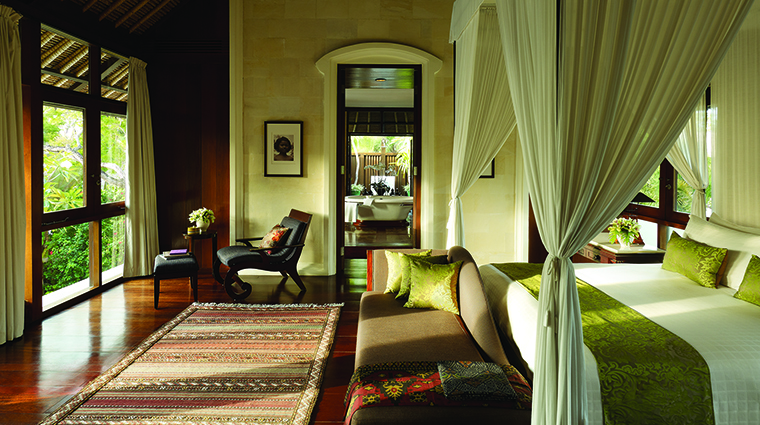 The villas here sit terraced along the hillside overlooking Jimbaran Bay. Each has its own small garden, terrace, plunge pool and covered outdoor lounge area. Villas have vaulted ceilings and are flooded with sunlight from the glass doors leading to the pool and the wall of bathroom windows facing the outdoor shower. 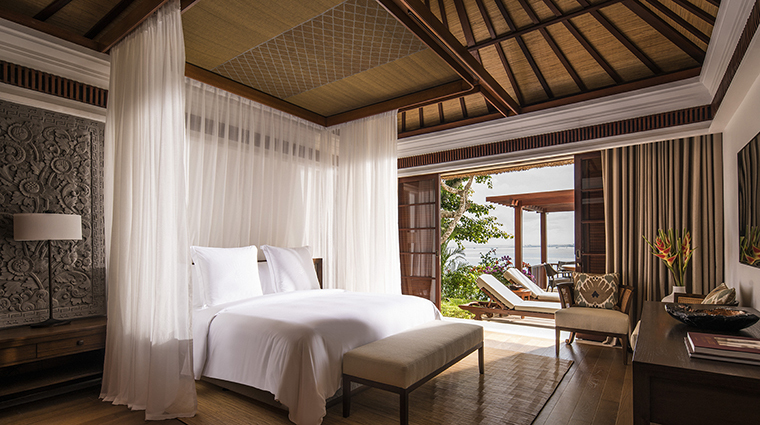 Décor within is clean and beachy with a Balinese twist — teak furniture, carved stone wall art, and white linens, including gauzy curtains surrounding a plush bed. Beachfront restaurant Sundara serves Asian fusion cuisine with dishes available in small, medium and large sizes, so you can try one of everything on the menu if you so please. You’d be remiss not to order seafood this close to the water, and the steamed blue mussels in a tangy broth as well as the scallop ceviche at Sundara are top-notch. Taman Watilan is spread across two open-air dining pavilions overlooking the bay, a space that includes nine live-action cooking stations ranging from a raw bar and sashimi to Indian favorites and street food-style noodles. Don't miss Taman Watilan's dessert humidor: a chilled walk-in cooler filled to the brim with chocolates, pastries, gelato and crepes.